On Sunday, Chandler Riggs, who plays Carl Grimes, tweeted at Chris Hardwick, “Nerdist you should have me on next week!” Or course, Riggs many fans thought this was a great idea, and they started tweeting their support. 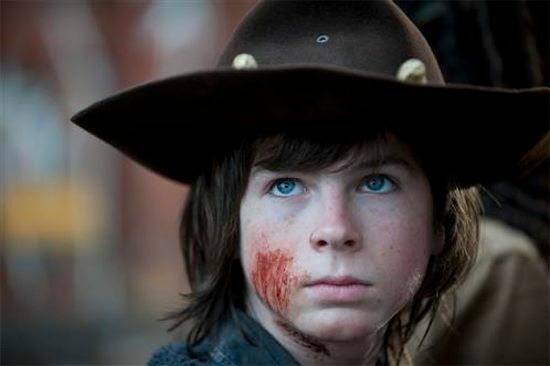 Chandler Riggs not being allowed on Talking Dead is leading to much speculation as to why. Could it be that something so shocking happens on the Season 4 Finale that AMC didn’t feel it was appropriate to have a child actor on to discuss? Or it is simply that AMC already has the guests planned out and mixing things up this late in the game could cause headaches? Talking Dead without Chandler Riggs airs on Sunday nights at 10 PM ET on AMC.